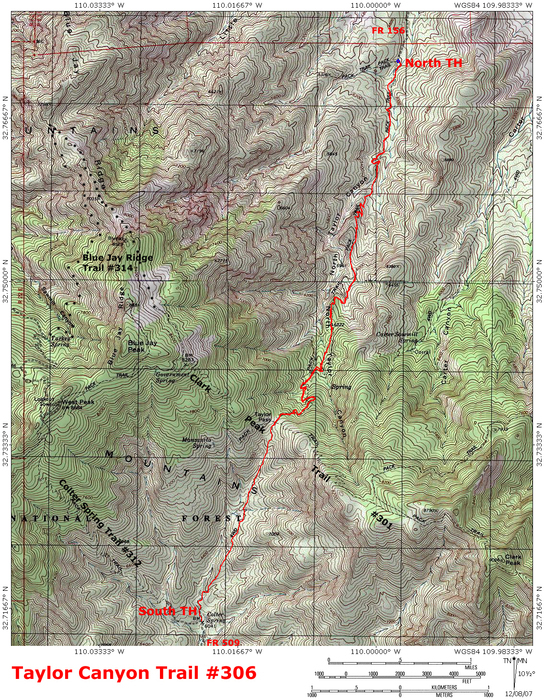 The Taylor Canyon Trail #306 is an up and over, high desert to tall pine route that runs through North Taylor Canyon, Taylor Pass, and finally down the south side of the Pinaleno Mountains, where it terminates at Colter Spring. This trail mainly serves as a connector route between the desert floor and the ridge line route of the Clark Peak Trail #301. I have not hiked the southern 1.5 miles of this trail due to the 4x4 requirement for access to the southern trailhead. A round trip hike on the northern/main section of this trail is 8 miles. Round trip distance for the entire trail is 11 miles. The Taylor Canyon Trail begins in oak woodlands where forest road #156 ends at a turnaround/camping area. This is the northern trailhead. The unsigned trail drops off the edge of the hillside and quickly descends to the creek bed of North Taylor Canyon, which it then crosses. The trail's signpost (minus sign) is on the east bank of the creek. The first quarter mile of the Taylor Canyon Trail is a little tricky to follow. Look for cairns and begin following its faint and somewhat overgrown route up canyon, along the east bank. The trail crosses over to the west bank at 0.15 miles and slowly becomes more defined. At 0.75 miles it crosses the creek bed again, and begins ascending the low brush covered ridge in the center of Taylor Canyon. Prolific oak and cat claw brush crowd the trail on this stretch, while Blue Jay Peak keeps watch thousands of feet above. The Taylor Canyon Trail leaves the ridge top around the 6000 foot contour and begins to skirt the mountainside. The deep canyon begins to close in and pines become more numerous. Following one more short stretch of ridge line, the trail begins to descend to the floor of North Taylor Canyon below towering forested ridges. A collapsed mine tunnel and some small seasonal pools of water greet you in the well shaded canyon bottom. The trail now crosses the creek and begins a prolonged ascent up the increasingly steep upper reaches of the canyon, via long switchbacks. The trail finally reaches Taylor Saddle at mile 4 and crosses the Clark Peak Trail at a pair of ancient trail signs. The Taylor Canyon Trail now heads south down the drainage of South Taylor Canyon. A few hundred yards down there are some views of the distant Galiuro and Rincon ranges over top of the Sulphur Springs Valley. This is where I turned around. 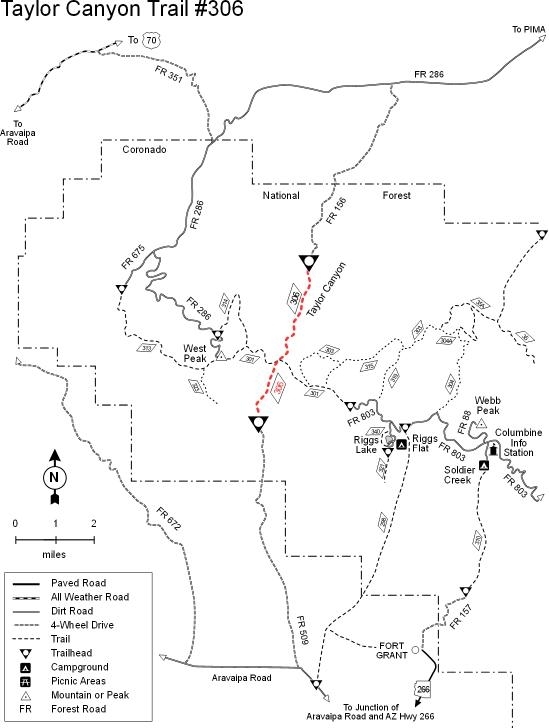 According to the forest service, the Taylor Canyon Trail continues down the canyon along an old 4 wheel drive road, and comes to an end at Colter Spring. Here it meets the old Colter Spring Trail #312 on the floor of the canyon, at the southern trailhead. This trailhead is accessible by forest road 509, which is a rough four wheel drive road coming up from the Aravaipa Road. Coronado FS Reports You can go all the way up and over the Pinaleno Mountains on this trail, although most people use it as an access route to the range's high ridge from either the north or the south side. Both ends of the trail start in riparian areas that are quite similar. The southern trailhead is located at the north end of FR 509 near a small spring, named Colter Spring. This 4-wheel drive road is in bad condition north of the National Forest boundary. It is a good idea to park your vehicle at the boundary and start your trip there. Colter Spring usually has water. Both North and South Taylor Canyons have intermittent water and are usually dry during the hottest time of the year. From these canyons the trail climbs through oak and juniper stands to the saddle at the top of Taylor Pass. This is the lowest point on top of the Pinaleno Range but it still provides good views both to the north and south. At Taylor Pass, the trail crosses the Clark Peak Trail #301 which traverses from east to west. To the east, it leads to the summit of Clark Peak and on to the end of the Swift Trail (Highway 366). To the west, the Clark Peak Trail leads to the summit of West Peak. NORTH TRAILHEAD: From the junction of highways 191 and 70 in Safford, AZ, follow highway 70 west approximately 9.6 miles, just past the town of Pima, AZ, and turn left (west) onto Tripp Canyon Road (there is a sign next to the highway, at milepost 329.8). Follow Tripp Canyon Road for 0.65 miles, then turn left on Patterson Mesa Road. Follow Patterson Mesa Road for 0.25 miles, then turn right (west) at Grand View Lane. After 0.3 miles on this unsigned road (this is forest road 286/Tripp Canyon Road), you will come to a fork. Stay left. Continue another 8.1 miles on forest road 286 to the signed junction with Forest Road 156 (Taylor Canyon Road). Turn left and follow Forest Road 156 across many dry washes and past a sign saying PRIMITIVE ROAD/HAZARDOUS TO PUBLIC USE (disregard the sign-not true). Forest Road 156 ends at the unsigned north trailhead, 5.9 miles after turning off Forest Road 286. High clearence 2wd is possible when dry. SOUTH TRAILHEAD (F.S. INFO): From Safford drive south 17 miles on US 191 to AZ 266. Turn right (southwest) onto AZ 266 and drive 19 miles to Bonita. From Bonita continue north on the Aravaipa Road about 2.5 miles to Forest Road 509 and turn north on this 4-wheel drive road. Pass the Seventy Six ranch house on the east side and continue on to the National Forest boundary (about 5 miles). The trailhead is located further north, but due to the bad condition of this last stretch of road, it is advisable to park here and hike/ride to the marked trailhead.